Imagine phones and laptops that never heat up or power grids that never lose energy. This is the dream of scientists working with so-called high-temperature superconductors, which can effortlessly carry electrical currents with no resistance. The first high-temperature superconducting materials, called cuprates, were discovered in the 1980s and would later be the subject of a Nobel Prize. The term "high-temperature" is relative—these materials operate at frosty temperatures of up to minus 135 degrees Celsius, a bit higher than their traditional counterparts, which work at even chillier temperatures near absolute zero (minus 273 degrees Celsius). Despite the fact that high-temperature superconductors were discovered three decades ago, researchers are still scratching their heads over how the materials work. Scientists know that the answer is related to electrons sticking together in pairs, as if glued together, but the nature of the electron "glue" that binds them is unknown. Pinpointing the glue could ultimately lead to the creation of room-temperature superconducting materials and pave the way for energy-saving computers and a host of other innovations, such as levitating trains. Caltech's Garnet Chan, Bren Professor of Chemistry, is attempting to crack the problem with a slightly different approach: quantum chemistry. He and his colleagues develop numerical simulations that, using the equations of quantum mechanics, map out the fluid motions of electrons in various materials. In a new paper in the journal Science, they have shown that high-temperature superconducting materials order themselves into a striped pattern of charges—what Chan and colleagues call "rivers of charge"—just before they become superconducting. By carrying out incredibly precise numerical simulations, Chan and his collaborators were able to rule out all the other candidate patterns of charges in favor of the striped state. They further examined what happens when the stripes are squeezed together, a scenario likely to occur from the natural fluctuations of the patterns, and found that the electrons spontaneously paired up. In other words, the rivers of charge are closely related to the long-sought electron glue. This finding amounts to a significant clue in the race to solve the problem of high-temperature superconductivity. "I like problems that people have banged their heads on for decades, and I think many scientists would agree that high-temperature superconductivity is probably one of the most perplexing phenomena observed in materials," says Chan. "Although the possibility for striped behavior had been raised previously, it was only one among a multitude of candidate competing patterns. Furthermore, people had no idea whether or not such stripes were good for superconductivity or in fact killed the superconducting state. Our results not only show that stripes are real but that they have an intimate connection to how superconductivity arises." In the new study, Chan and collaborators at multiple institutions used four very different types of numerical methods to simulate high-temperature superconducting materials. 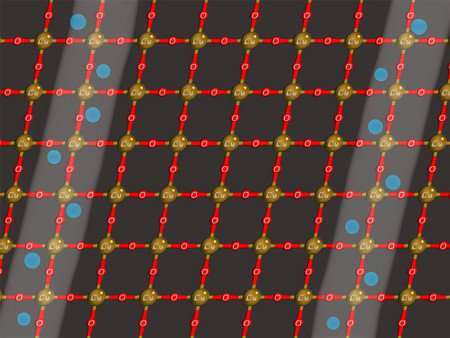 In general, scientists describe these materials using the Hubbard model, a mathematical model developed in the 1960s that explains the electronic behavior of many materials—in particular those exhibiting high-temperature superconductivity. Although the equations of the Hubbard model are relatively simple, solving them for the behavior of the electrons requires computing power. That's where the new numerical methods helped out: they predicted how the electrons are organized in the materials with improved precision, and they showed that the charges spontaneously organize themselves into the striped patterns. "We have provided a definitive numerical solution to the one of the most important models in condensed matter physics, which has strong connections with high-temperature superconductivity," says Bo-Xiao Zheng, lead author of the study and former PhD student at Caltech and Princeton. "What's more, we used four independent numerical simulations to come to the same conclusion—a necessary cross-check given the complex behaviors possible in these materials." "This puts in place an important piece in the puzzle of how high-temperature superconductors work," says Chan. "In turn, this provides optimism that a full understanding will one day be possible." Is mass the same as matter? What is the speed of a superstring in the theory M? I don't see when/if finding a room temperature superconductor being that big of deal, unless cost of production can be relatively on part with traditional wiring. Room temperature superconductors would really just make technologies already using them cheaper and less bulky. There is also another way to attack this problem and that is finding easier and cheaper ways of keeping already existing superconductors cooled. There are likely meta materials that could help with that. Research on superconducting is still very important though since it is still a bit of a mystery. A room temperature superconductor may need other criteria such as being under extreme pressure though and mat not be as practical anyways.